Some things are indisputable: the sky is blue, water is wet, and pizza is the best food ever invented. Okay, that last one may be a matter of opinion but we called it a fact so it must be true. In the spirit of questionable claims like that last one, Villa Italian Kitchen, a 300-plus location chain of mainly food court eateries, posted a promo for #AlternateFacts pizza on its Facebook page, touting the pie’s calorie count as zero. That’s despite the fact that the pizza is topped with bacon, pepperoni, ham and sausage, along with the sauce and whole milk mozzarella. Hey, it could be. A lot of people are saying it has no calories. Anyone who thinks that pie has calories is a pizza hater and a loser. SAD. The pizza’s name is, of course, a nod to presidential counselor Kellyanne Conway’s defense of Press Secretary Sean Spicer’s false assertion that President Trump’s inauguration was attended by over a million people. 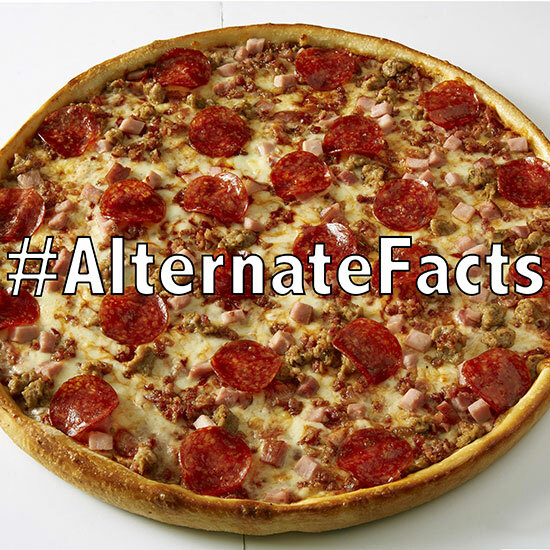 Estimates put the attendance around 250,000-600,000 at best, but on Meet the Press the following day Conway called the White House's untruth “alternative facts.” The hashtag #alternativefacts took off on social media, so clearly Villa Italian Kitchen's new menu item is an attempt to capitalize on the humorous side of presenting lies as truth. That is, if you think there’s anything funny about that.